Explore Melbourne at your own pace! Hop on and off at the most popular Melbourne attractions! See the very best of Melbourne on both land and water with your Melbourne hop-on, hop-off tour and river cruise. Enjoy a flexible experience while making sure you don’t miss any of the sights with your Melbourne hop-on, hop-off ticket. Witness the famous Melbourne landmarks and attractions such as Melbourne University, Federation Square and Docklands Stadium. Customise your travel and create your own itinerary – the choice is yours! Your hop-on, hop-off ticket is valid for 24 hours and the buses operate on two routes – the City Route (red) and the St. Kilda Route (blue). You have the freedom to hop on and hop off from the buses at any of the sites at your will. After your open-top bus tour around the city, you can choose one of the three great cruises, which cover different aspects of the city as well as offer spectacular views of the Melbourne skyline from the river. Ports and Docklands Cruise: Sail along one of the busiest trading ports in the Southern Hemisphere, the Melbourne Central Business District and enjoy stunning views of the historic Victoria Docklands. River and Gardens Cruise: Meander past picturesque gardens and parks, as well as take in sights of some of Melbourne’s famous sporting venues including the famous Melbourne Cricket Ground. Return Williamstown Ferry : Enjoy stunning views of Melbourne skyline from further round the coast as you take a return ferry cruise over to Williamstown. Hop-on, Hop-off Tour: Buses depart between 9:30am and 5:30pm; every 40-60 minutes. Since this is an outdoor activity, the schedules might just change sometimes. Check the frequency and bus operating hours on the day of your tour just to be safe. Hop-On, Hop-Off: Redeem your tickets at Federation Square (Mobile Vouchers are accepted here). To start from any of the stops, please show printed voucher to the driver. River Cruise: Cruises depart from Southgate Promenade, near the Langham Hotel on the river’s edge. Please arrive at the start point 20 mins prior to departure. Cruise departure point is a 5 minute walk from Federation Square (stop 1), you may choose to start with cruise after exchange of tickets. 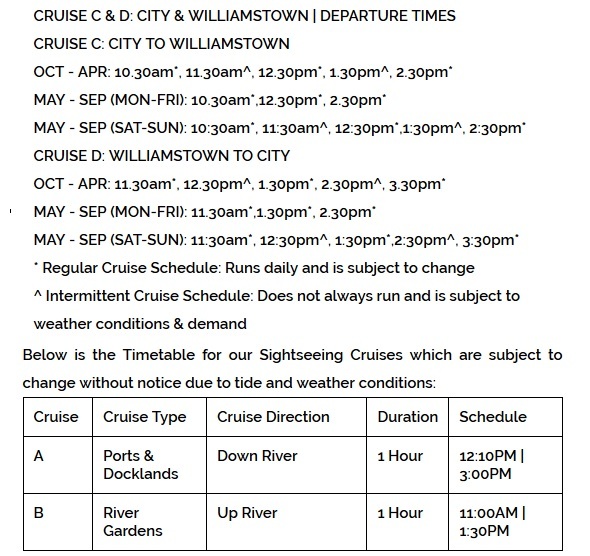 Timetable for the Melbourne River Cruises is subject to tidal and weather conditions and demand. We strongly recommend contacting Melbourne River Cruises (03 8610 2600) to confirm tour departure times. No/limited river cruises available on public holiday and event days.